There are barely enough superlatives in the dictionary to describe the financial performance of the world’s best developed market banks. These global powerhouses are enjoying a period of sustained profit increases that are so dramatic that perhaps the only cloud on their horizon is the possibility of a public backlash against their remarkable ability to make mind-boggling sums of money. Assuming they do not become victims of their own success, the banks listed on the following pages will almost certainly continue to dominate the world financial scene for years to come. 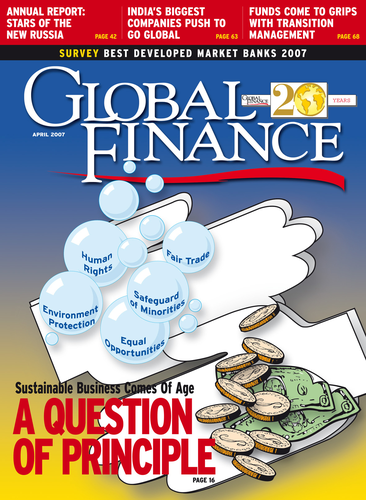 All selections were made by the editors of Global Finance after extensive consultations with bankers, corporate financial executives and analysts throughout the world. We considered a range of objective factors, including growth in assets, profitability, geographic reach, strategic relationships, new business development and innovation in products. Subjective criteria included the opinions of equity analysts, credit rating analysts, banking consultants and others involved in the industry. The mix of these factors yields leading banks that may not be the largest, the oldest or the most diversified in a given country, but rather the best—the banks with which corporations around the world would most likely want to do business.